Drawing and painting are about observing, seeing and communicating information. 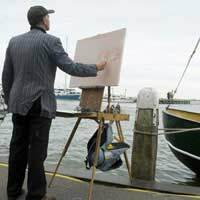 At one time drawing and painting were the most advanced ways of communicating data from one person to another! For this reason 'seeing' and interpreting the world is at the heart of learning to draw and paint. The eyes and, indeed, all of the other senses are fundamental to creative expression: Drawing and Painting is not just about the 'hands'. Everybody sees and interprets information differently. There are many different factors that affect the way we 'see'. Height, eyesight and body size all impact on how we record and interpret information. Factors such as personality type, confidence and social attitudes also affect the way that we see, and the way that we communicate to others. The name for the fact that we all see differently is 'subjectivity'. Sometimes people try to paint something in an entirely 'factual' way. In this case they try and convey an image exactly as it appears to all people. This is called 'objective' drawing. However, it must be remembered that what the individual chooses to draw in the first place is a personal subjective experience. For this reason it is useful to bear in mind before starting to draw or paint that as art is such a personal experience, there really is no wrong way of doing things. Painting and drawing, as personal expressions, are always 'right'! This, amongst other things we will learn on this site, should help you to gain confidence as you learn to paint and draw. Before you paint you will choose what to paint. However you approach this choice, the final decision will be intensely reflective of who you are. You may to choose to paint or draw a seascape, suggesting an affinity with nature and water, or you may choose to paint a loved one or a political slogan, demonstrating, respectively, a caring nature and a socially concerned nature. Apart form what we choose to see, there are a great many historical and social factors that may affect what we choose to see. At some point it is important to become aware of these factors so that one can ensure that they paint and draw with the true freedom of an independent artist. Throughout this site this point will be come back to, in the interest of developing artists that question their reality, instead of submitting to it 'blindly'. Artists are innovators as well documenters. Expressing what you see depends partly upon gaining a certain level of practical skill, which can be achieved through the practice of drawing and painting exercises, and partly on developing a confident freedom of expression, which depends on developing the right mental attitude. Both of these issues will be addressed throughout this site. Ultimately what this site aims to do is to equip the reader with a broad range of skills necessary to the enjoyment and development of drawing and painting skills.